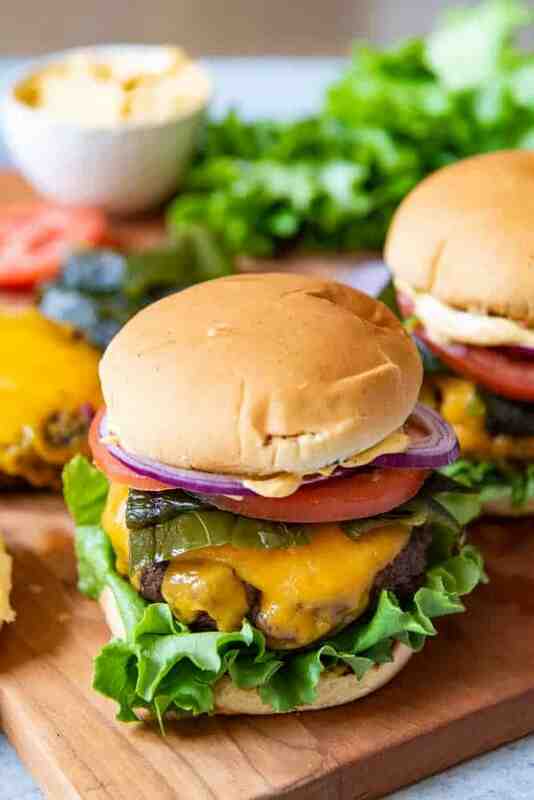 Grilled poblano peppers, sharp cheddar cheese, and chipotle aioli come together with a juicy, grilled hamburger patty and toasted buns to create these majorly flavorful Grilled Poblano Pepper Southwest Burgers. The smokey, charred poblano peppers add a touch of a sweetness and mildly spicy heat that we love! Poblano peppers are a moderately spicy pepper often used in Southwestern cooking. With an earthy, smoky flavor and slight sweetness that is brought out by grilling or roasting the peppers until the outer skin is blackened and charred, the peppers are easy to peel and use after covering the hot, charred peppers in a dish with plastic wrap for 15 minutes. The charred skin then peels right off and the softened flesh of the peppers is left behind. 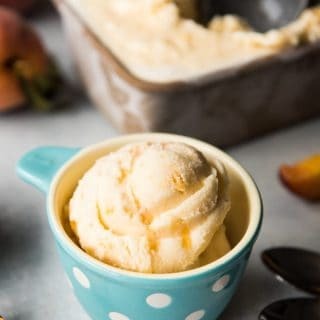 The same approach works with other pepper varieties like the spicier serrano or jalapeno or the milder anaheim or bell peppers that don’t add any heat at all, and really, any of them can be used to top amazing burgers and add instant southwest flavor. When it comes to the patty itself, less is more, in my opinion. Because I really wanted the flavor of the poblano pepper itself to shine through, I opted against adding spices to the burger itself beyond a generous sprinkling of salt and pepper, which is essential to creating a juicy, not bland burger. Instead, I boosted the tastiness quotient of the burger by channeling other southwest flavors of cumin, garlic, and chipotle into an amazing aioli that can double as a dipping sauce for fries if you want. Then I opted for a sharp cheddar cheese because it has a stronger flavor that goes wonderfully well with poblano peppers. 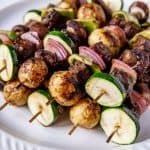 With Memorial Day and summer right around the corner, and weather that is finally starting to warm up, it seems like the perfect time to start sharing more grill recipes. And since May is National Burger Month, I thought deliciously juicy grilled hamburger recipe was the way to go. It’s also this month’s H.O.N.E. 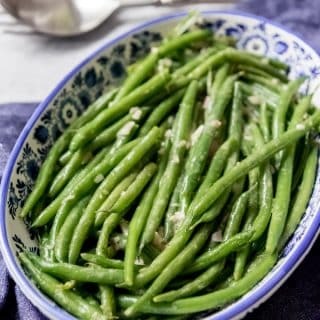 Monthly Cooking Challenge! 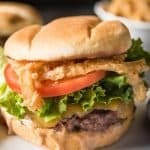 I’ve already shared a classic All-American hamburger with crispy onion strings, but I wanted to spice things up a bit and do a burger a bit beyond the norm. 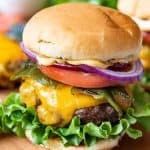 You can make any burger you would like for the challenge, and to help you out, I’m including all of my best burger tips and techniques in this post. 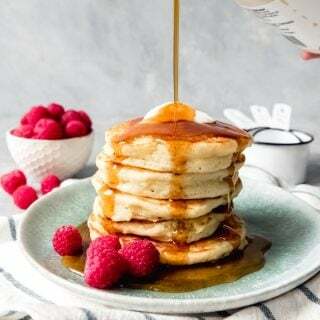 Just be sure to share your photos throughout the month using the hashtag #honecookingchallenge on Instagram or email me, tweet me, or upload a photo of your recipe to my Facebook page so I can see what you are creating! You could absolutely roast your poblano peppers in the oven instead of grilling them, but in the summertime I try to avoid heating up my kitchen if I can help it. 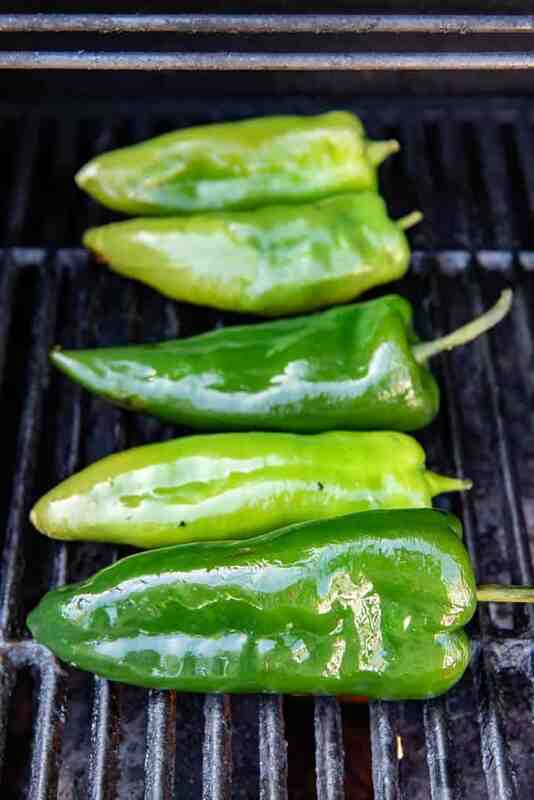 Since we are already using the grill for the hamburgers, it’s just easier to roast the poblano peppers outside on the grill instead. There are lots of ways to do this, but here is my favorite approach. First, I rub the peppers with a little olive oil before grilling them. There’s no need to cut off stems or remove the seeds first as that will actually be easier to do after the peppers are softened. 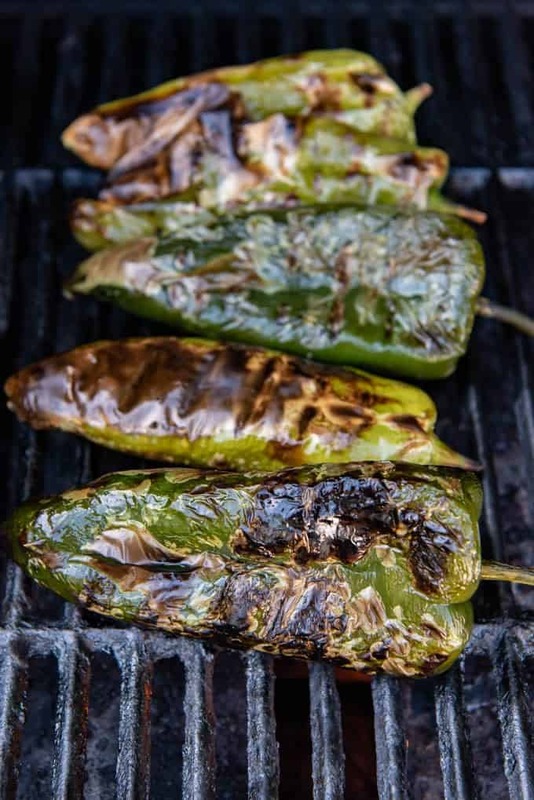 To roast poblano peppers on the grill, get the grill nice and hot to a medium-high heat with the lid closed, then turn off the burners on one side of the grill (if using a gas grill) or move the coals (if using a charcoal grill) to create an area of indirect heat. Then set the whole poblano peppers in that indirect heat area and close the lid so that they can roast for 10-15 minutes. The skins will start to blister and you will want to turn the peppers once or twice to make sure all sides are cooking evenly. After 10-15 minutes of indirect heat, move the peppers over to the direct heat area of the grill (right over the flame is using a gas grill) and grill the peppers until the skins are charred, turning every couple of minutes to get all sides of the pepper. Transfer the grilled peppers to a dish or plate and cover tightly with plastic wrap so they can sit for 10 minutes or so until they are cool enough to handle and have steamed just a bit, which helps make it really easy to remove the skin from the flesh of the pepper. Now you can just peel the charred skin away from the pepper and slice it open on one side to remove the seeds and stem. Cut the poblano peppers into large slices to use for topping your southwest burgers. To make the best burgers, start by dividing the meat into equal portions, about 6 ounces each or roughly the size of a tennis ball. Gently shape into burgers that are slightly larger than the size of the buns you plan to use. 3/4-inch-thick is a good size to make sure that you end up with a thick, juicy burger. The patties might seem large, but keep in mind that they will shrink when as they cook! Make a depression in the center of each patty with your thumb. This will help the burger cook evenly without puffing up in the middle quite as much. Generously season both sides of each patty with salt and freshly ground black pepper. This is done to personal preference but I usually use around 1/4 teaspoon of salt per patty, and a little less pepper than that. Get your grill going so that it can get nice and hot – medium high to high heat is best for grilling burgers. 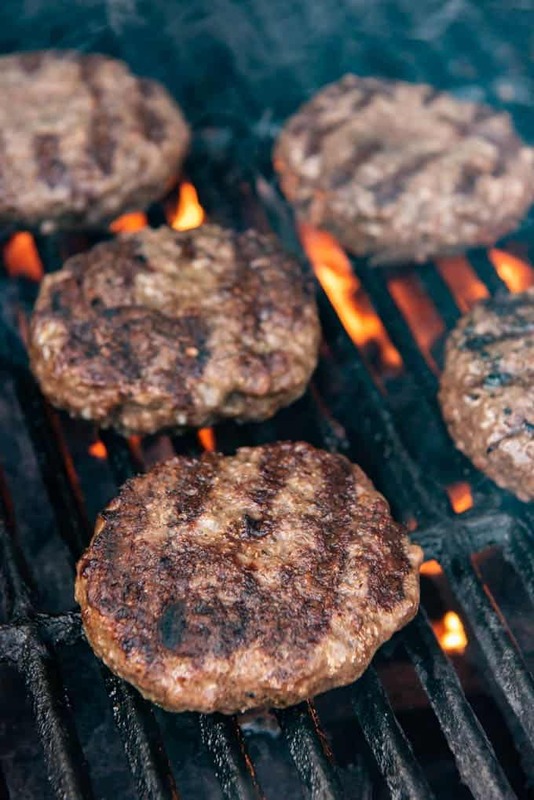 Add the hamburger patties directly over the flames or heat source and grill, covered, for 3-4 minutes on each side for burgers that are medium-rare to medium. If you prefer your burgers to be closer to medium to medium-well done, cook them for 4-5 minutes on each side. During the last few minutes of grilling, top the burgers with the sliced cheese so it can melt and toast the buns. 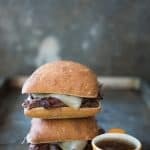 Let the burgers sit for 3 to 4 minutes after removing from the grill so that the juices can redistribute before serving. 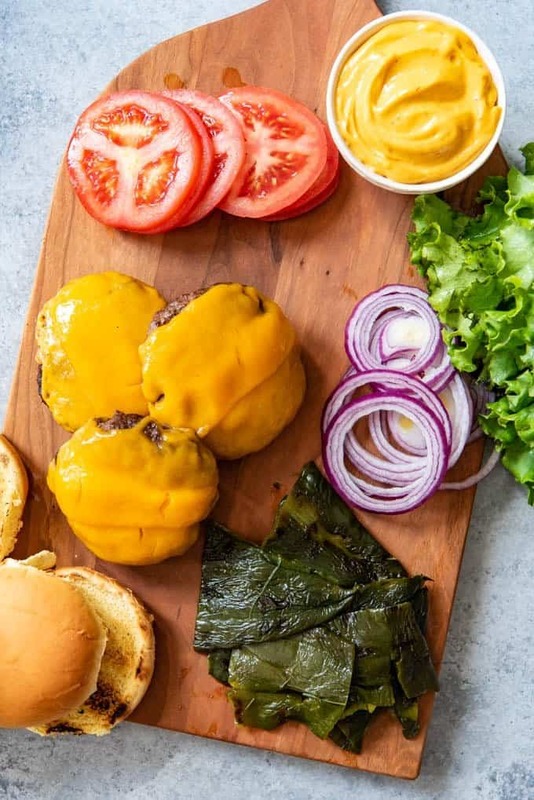 Assembly your Southwest burgers by placing some nice, leafy green lettuce on the bottom bun, followed by the burger with melted cheese. 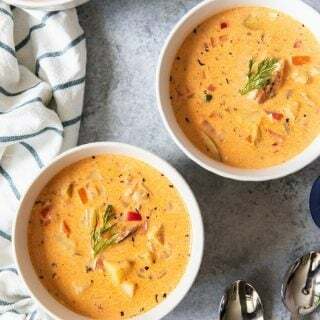 Then arrange a couple slices of roasted poblano peppers, fresh garden tomatoes, and red onions, followed by the top bun that is slathered with the homemade chipotle mayo. For the love, please don’t use pre-formed frozen patties. I guess they are fine if you are mass cooking for a crowd, but you just cannot get a juicy, quality burger with those things. Flipping your burgers more than once is detrimental to a succulent, juicy burger. It can turn a perfectly good hamburger patty into a hockey puck. Pressing down on your burgers with a spatula while they are cooking. It might be tempting, especially when the burgers start to shrink (which they inevitably do, more on that in a sec), but smooshing the burger down with the backside of your spatula just presses out all the delicious juices and flavor that make a truly incredible burger. Don’t do it! Choose the right meat! Go with ground chuck or 80/20 ground beef. Ground chuck is known for being richer and more flavorful, but it also has a higher fat and calorie content. Burgers aren’t exactly diet food and super lean ground beef typically makes disappointingly dry burgers that are lacking in flavor. Fresh 80/20 ground beef is my preferred choice. Form your hamburger patties loosely, using your hands. Try not to compress or overwork the meat too much while making the patties. Shape your patties a slightly larger than the buns you plan to use since the burgers will shrink a bit while grilling. 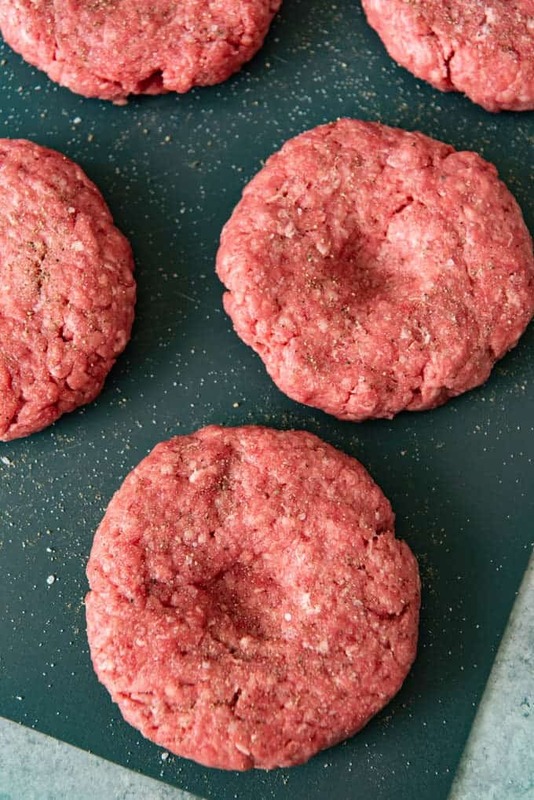 Make an indentation in the center of each patty by pressing with your thumbs. This will help the burgers cook evenly and not plump up quite as much while cooking. When it comes to burgers, I want to taste actually taste the meat itself without it getting overpowered by adding in too many fillers or spices. Which is why I typically take a minimalist approach and only season my hamburger patties with kosher salt and pepper. But along that vein, generously season both sides of the patties with salt and pepper just before grilling. Like with a good steak, salt is key to a well-seasoned and flavorful burger – don’t skimp! Grill on high heat and only flip the burgers one time. Flipping them too frequently doesn’t allow the meat juices disperse as well, and you will end up with sad, dry burgers. Let the burgers sit for a few minutes before serving so the juices can redistribute into the meat. Use quality hamburger buns (brioche, french, or potato are my picks) or make your own from scratch. 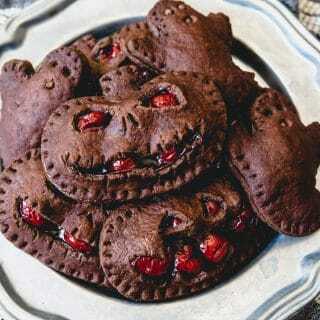 Then toast them! Toasted buns are essential for a fantastic burger experience. 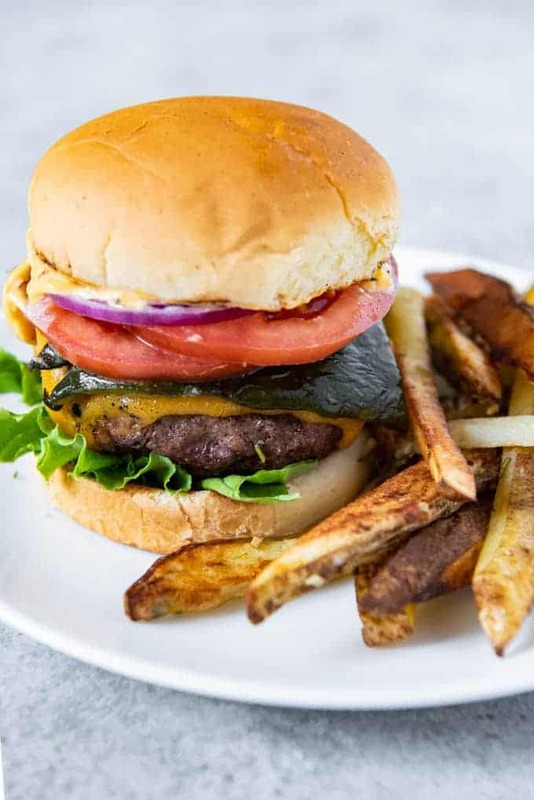 Grilled poblano peppers, sharp cheddar cheese, and chipotle aioli come together with a juicy, grilled hamburger patty and toasted buns to create these majorly flavorful Grilled Poblano Pepper Southwest Burgers. The smokey, charred poblano peppers add a touch of a sweetness and mildly spicy heat that we love, but you could always sub in serrano or jalapeno peppers for even more spice, or cool things down with milder peppers like anaheim or bell peppers. Roast the poblano peppers by first rubbing them with a little olive oil. Heat the grill to a medium-high heat, then set the whole poblano peppers over an area of indirect heat area (turn off burners if necessary, or rearrange coals so the peppers aren't directly over the heat source) and close the lid so that they can roast for 10-15 minutes. Turn once or twice to make sure all sides are cooking evenly and the peppers begin to blister. Move the peppers to the direct heat and grill until the skins are charred, turning to get all sides of the peppers. 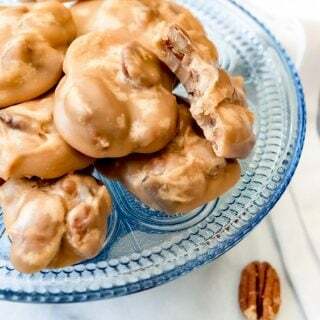 Transfer to a dish or plate and cover tightly with plastic wrap for 10 minutes until cool enough to handle. Peel the charred skin away from the peppers and slice open to remove the seeds and stem. Cut the poblano peppers into large slices to use for topping your southwest burgers. Alternatively, preheat oven broiler to high, then place the poblano peppers on a foil-lined baking sheet and broil about 8 minutes, turning occasionally, until blackened, then continuing to sweat the peppers as described above. To make the burgers, divide the meat into 6 equal portions, about 6 ounces each or roughly the size of a tennis ball. Gently shape into burgers that are slightly larger than the size of the buns you plan to use, about 3/4-inch thick. Make a depression in the center of each patty with your thumb and generously season both sides of each patty with salt and freshly ground black pepper. Heat the grill to medium-high heat, then place the hamburger patties directly over the flames or heat source and grill, covered, for 3-4 minutes on each side for burgers that are medium-rare to medium. If you prefer your burgers to be closer to medium to medium-well done, cook them for 4-5 minutes on each side. 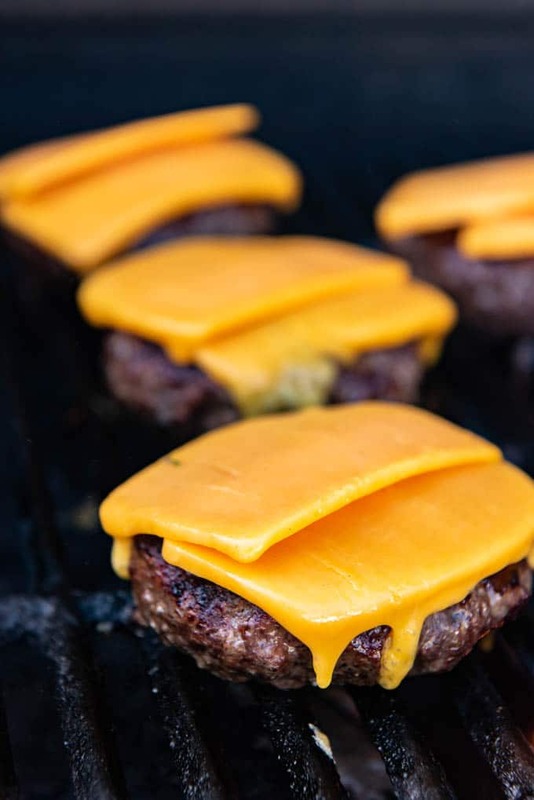 During the last few minutes of grilling, top the burgers with the sliced cheese so it can melt and toast the buns. 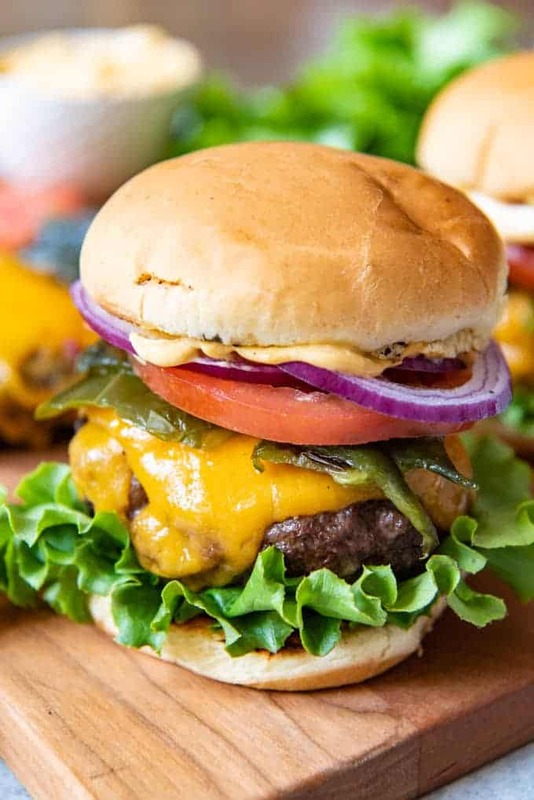 Assemble the burgers by laying a piece of lettuce on top of the toasted bottom bun, followed by the burger with melted cheese, slices of poblano pepper, tomato slices, onions, and the toasted top bun that has been generously slathered with chipotle aioli. 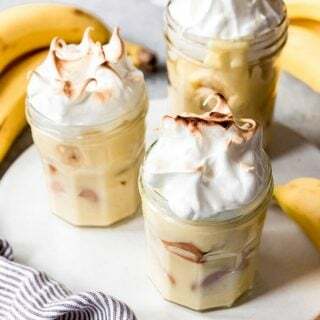 Combine all of the aioli ingredients except for the olive oil in a food processor or blender and process for 20 seconds. With the processor running, very slowly drizzle the oil in a thin stream into the egg yolk mixture, taking about 2 minutes to pour all of it in, until completely incorporated and the aioli is emulsified. Anaheim peppers also work well, or you could sub serrano peppers if you want it spicier. You’ver perfectly encapsulated everything about the Southwest in this burger! 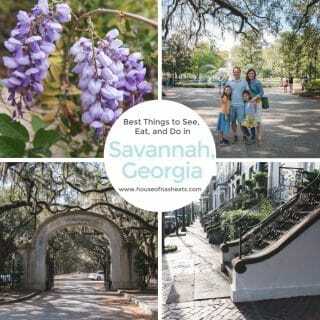 I can just taste the grilled poblano peppers (excellent choice!) and the chipotle aioli! Now I want one!